Now, cut a ribbon piece slightly longer than the circumference of your candle, put tape on the back, and tape the ribbon onto the candle. Done. Hint: Try layering different widths of coordinated ribbon for a different look. 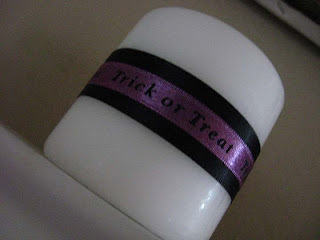 This one has a wider black ribbon, with a smaller purple ribbon on top. This ribbon was from Michael's. 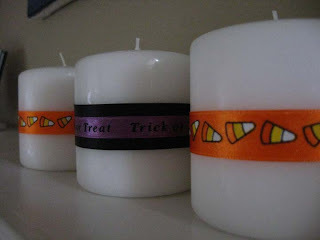 The ribbon in their $1 bin is the perfect length to make 1 or 2 of these candles. These would make great little I'm Thinking of You gifts for neighbors and co-workers as well! Happy Crafting! I love it! So cute and something that I have time for and can manage! Thanks! I'm making these too! Way too easy to be so cute! Thanks for the idea!